How To Combine Multiple Word Documents In a Single Document in Word 2013? This article will explain how to combine or merge multiple word documents to one single document in Microsoft Word 2013. 1. Launch Microsoft Word 2013 and open the “Insert” tab. 2. 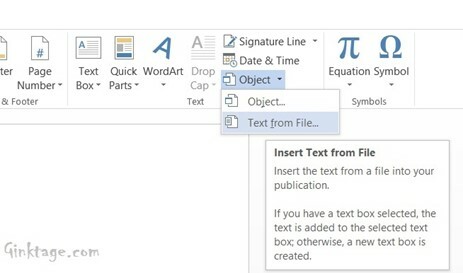 To add the word document, click the Object DropDownList and select Text from File option. 3. In the “Insert File” Dialog, select the Word Document(s) to insert. 4. You should now have the selected documents combined in one document.